What a Wet Spring Means for your Garden - Kalleco Nursery Corp.
Spring sprung late this year and with it came some serious rain. Prolonged winter and a rapid rise in temperate in late April made for wet conditions everywhere. While rain is great for your landscape, an unusually wet spring like this can pose some unique challenges for your garden. Warm, wet weather can help your plants thrive, but it also turns your landscape into the perfect environment for bacteria and fungus. Fungi like downy and powdery mildew can pop up on everything from your annuals to your trees. White dusty coatings or layers of fine white fuzz on your leaves are the main symptoms that either of these fungi have gotten into your garden. The good news is, neither are particularly harmful to your plants. They are, however, a bit of an eyesore. Any fungicide containing copper sulfate should take care of this pest. 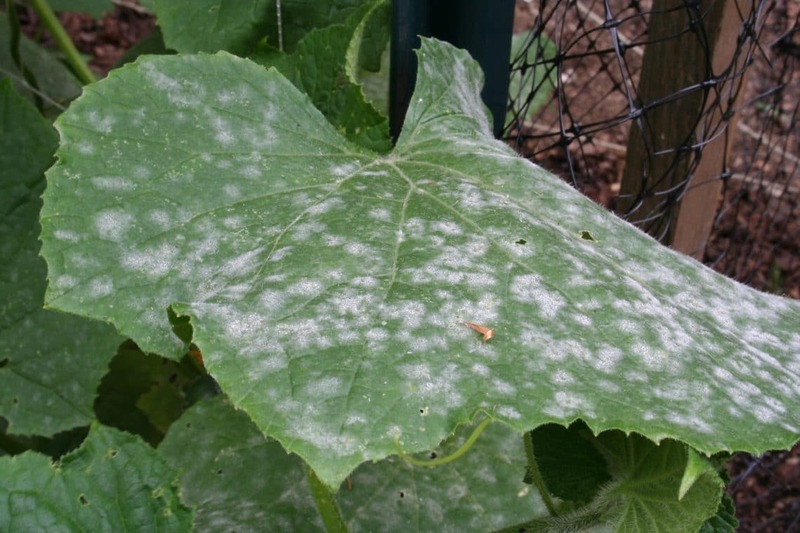 Powdery mildew on cucumber leaves. Cucumber and squash plants are most susceptible to this pest. Bacterial diseases are more complicated. Bacteria are spread in myriad ways, from precipitation to pollination. There’s no surefire way to prevent it, and some infections are more serious than others. 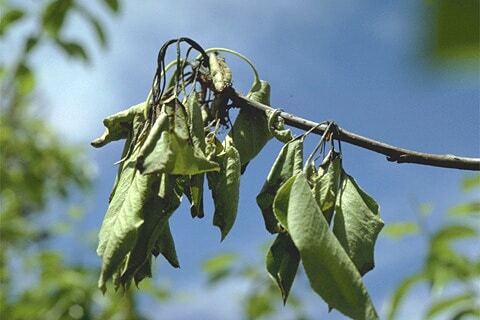 Leaf Blight is probably the most common bacterial infection here in the Hudson Valley. You’ll notice tell-tale dark spots on leaves, especially on maples. While these spots are unsightly, they’re also mostly harmless. Another bacterial infection, Fire Blight, is a more serious matter altogether. Fire Blight primarily affects members of the rose family – that includes your flowering and fruiting trees like apples, pears, and peaches too! Look out for branches full of dead leaves that don’t fall off, and dark discoloration on the stems. The most recognizable symptom of Fire Blight is the “shepherds crook”, or the signature bending of the affected branch. A close up of the “Shepherds Crook” bending commonly seen with Fire Blight. Fire Blight can pose a threat to your tree, so it’s important to take care of it as soon as you recognize it. Locate the point of infection, then go back about 6″-8″ from the point at which the discoloration stops and give it a snip. If a branch is infected all the way to the main limb, cut as far back as you can. If you’re doing any other pruning that day, make sure to clean your pruners between each cut. It may sound tedious, but wiping the blades with a disinfectant wipe or dipping them in alcohol stops your shears from spreading the infection any further. Once you’ve pruned out the infected material, it’s also important to dispose of it! Definitely don’t add this to your compost pile or leave it around. The best option? Burn it! How has the wet, warm spring affected your garden this year? Have you noticed any mystery spots or unusual formations? Let us know! We’re always happy to help.